If your top load Whirlpool washer will not agitate, it might be that the directional cogs or “dogs” are worn out. This is a common problem and a cheap simple fix. If you take your hands and rotate the agitator, it should go in one direction only. It will move to the right, stop and move to the right again. It should not spin freely or go right and left. 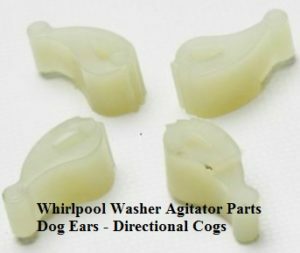 If the agitator is not moving properly then it’s time to install new agitator directional cogs because they are probably worn out. Using a 1/4″ or 3/8″ socket set and some needle nose pliers begin by removing the fabric softener cup, just pull up on it until it pops off of the agitator. Next, remove the inner cap and seal inside the agitator using your needle nose pliers. Using a 7/16″ socket and ratchet, remove the bolt in the center of the agitator. the black retainer from around the cam, lift off the directional cogs and taking notice of how they fit in the cam, replace them with new ones. Slide the retainer back on until it clicks. Reinsert the cam back into the agitator barrel and reinsert the bolt in the center. Replace cap and gasket assembly pressing on it firmly until it snaps into place. Next, replace the fabric softener dispenser and your ready to go. You don’t normally think of your refrigerator as an appliance that would leak water but they sometimes do. Finding the source of the leak takes some investigation but it is relatively simple to do. A very common problem is that the defrost drain could be blocked. The drain has a small opening that is easily clogged by food particles or ice. During the defrost cycle, water could build up and not be able to drain into the pan. The water would then leak out onto the floor. You can clear the drain by pouring hot water over it and using a stiff wire to remove the blockage if there is any. Normally the drain pan is not the problem but it can develop a crack and that would allow water to leak. Only a small amount of water usually accumulates in the drain pan and not enough to overflow. This water evaporates, with help from the condenser fan, which blows warm air across the surface of the pan. Do a thorough examination of the drain pan looking for any damage or cracks. If the pan is damaged, replace it. The water line connections to the ice maker can sometimes come loose or the seals can crack from age. The plastic hoses can crack, tear or get kinked which would cause pressure at the connection and cause a leak. The water line going to the ice maker is normally on the back, outside of the refrigerator. Check this line and its connections for any signs of moisture. If the ice maker supply line is the problem there will normally be water running or dripping down the line onto the floor. You should tighten all of the connections or replace the water line. If your refrigerator has a filtering system the connection between the water filter and the water supply can cause a leak. The filter may have been installed incorrectly, wrong size or wrong model for the refrigerator. It’s also possible that it may be very old and the housing or seals are cracked, therefore allowing water to escape. Remove and replace the filter if you see water running down the outside of the filter and into the interior of the refrigerator. Make certain the filter is the one specifically for your model. Having a refrigerator that is not getting cold enough is both costly and unhealthy. Food can spoil much faster than the expiration date and can make you sick. Normally the problem is one that is easily fixed. 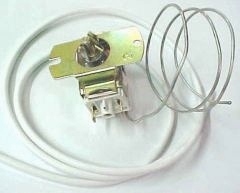 The door switch is located along the internal frame of the refrigerator. It turns the light on when the door is opened and off when the door is closed. If the switch is not operating correctly, when the door is closed the refrigerator will not resume cooling and if the interior light stays on it will also affect the temperature because of heat from the interior light. Condenser coils are located either under or in back of the refrigerator. 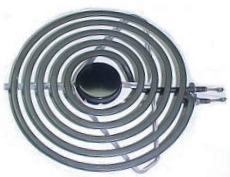 If you find that these coils are dirty, unplug the refrigerator before attempting to clean them. If the coils are dirty they will not let the refrigerator cool properly. Refrigerator door gaskets keep the cold air in when the door is closed as long as they have a proper seal. Gaskets can become loose or damaged therefore letting cold air leak from the refrigerator. Constantly opening and closing the refrigerator door lets cold air out and warm air in. If the temperature control thermostat is faulty the refrigerator will not maintain the correct coldness. Check your refrigerator temperature to determine if it is set at the correct level. 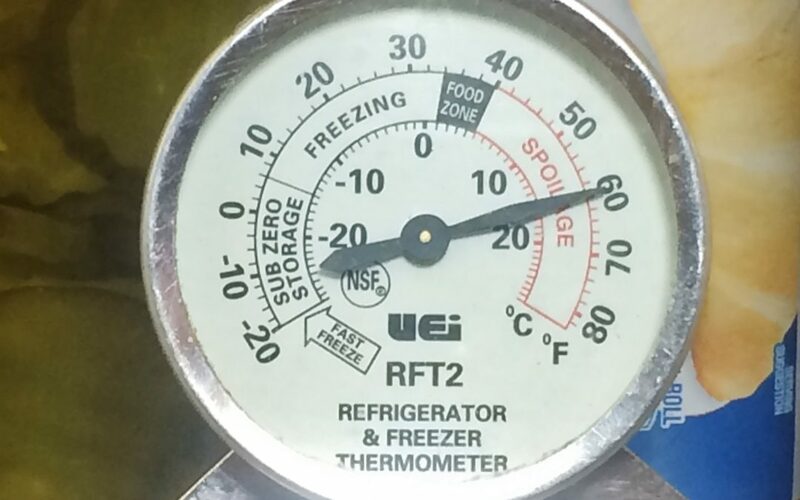 A normal refrigerators setting is usually around 32 degrees Fahrenheit (0 degrees Celsius) and 1.4 degrees Fahrenheit (-17 degrees Celsius) for the freezer. When the frost-free feature is not working it will cause a buildup of frost around the evaporative coils in the freezer. This in turn causes the evaporator fan to malfunction and not be able to blow cold air around. Should the fan hit the frost it could be damaged. If you have your refrigerator stuffed with food and everything is crammed together then the air will not be able to flow freely inside the refrigerator. This will not allow a correct temperature of coolness to flow around your food items. Not having enough food items in the refrigerator will also cause it to function inefficiently. Cold air flows through vents between the freezer and refrigerator. If ice forms in the vents the air will be blocked from flowing into the refrigerator thus not letting the refrigerator cool down properly. If this happens you can unplug the refrigerator and let the ice melt, then reconnect the refrigerator. This is not very common but if you suspect this is your problem it would be wise to call a qualified service technician. for many makes and models, of side by side refrigerators, as well as top or bottom freezer units. GE, Maytag, Whirlpool, Amana, Frigidaire refrigerators, as well as many other major brands. The diagnostic help outlined below is intended to be used only by professional appliance repair technicians. If you are attempting to repair your refrigerator yourself, be aware that you are working with potential dangerous electrical currents that can cause serious injury or death. 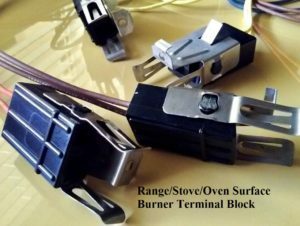 Be aware that appliance parts have extremely sharp edges and moving parts that can cause serious injury or death. Always remove the power source from the unit you are working on. Unplug it! When unplugging or removing the power source, double check to make sure that you removed the proper cord or turned off the proper breaker. When tightening parts make sure that if the tool you are working with or your hand slips, you will not be injured by sharp or jagged edges. Keep children and pets away from the working area and disassembled refrigerator parts. Be aware that there are other hazards involved in appliance repair, besides those listed above that may cause serious injury or death. Always use extreme caution when removing or installing parts. Refrigerator and freezer repair help. Squealing noise coming from the refrigerator or freezer. Frost is building up in the back of the refrigerator or freezer section. Be aware that the refrigerator repair tips and diagnostic information given below is general in nature and is not meant to be all inclusive nor necessarily apply to your Refrigerator unit. The refrigerator makes a high pitched squealing sound, or chirping sound. Possibly coming from the freezer compartment, but does not make this noise all of the time. 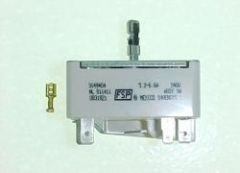 You may need a new freezer fan motor. This problem is more common in some older model refrigerator units. Noise appears to be coming from behind refrigerator, near the bottom. 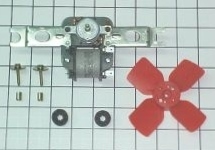 The refrigerator condenser cooling fan motor blade, located at the back of the unit near the compressor, may be be striking a foreign object, such as a piece of paper, cardboard, or some other object. Very easy refrigerator repairs, no parts needed. Fan blade may be loose. Fan motor shaft may be loose. Motor mount screw may have come off. 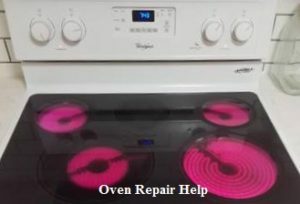 This diagnostic repair information applies to most refrigerator units, including Whirlpool, Kenmore, GE, Amana, Maytag, KitchenAid and Frigidaire. Frost building up in back of refrigerator or freezer section. Defrost thermostat limit is defective. Freezer fan motor is not working. Noise appears to be coming from the freezer section. The refrigerator freezer fan motor blade may be loose. The motor shaft may be worn out. The blade may be striking ice build up or a stray ice cube. 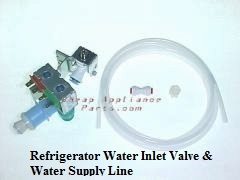 Most of the refrigerator parts that are mechanical, such as a defrost timer, light switch, freezer fan motor, condenser fan motor, compressor, defrost element, fan switch, fan blade, cold control, thermostat, defrost terminator, limit switch, ice maker and water valves can usually be obtained for most of the above mentioned repair parts, even for refrigerator units that are 25 to 35 years old. These parts are still readily available. Admiral, Amana, Americana, Arctic Air, Bosch, Caloric, Crosley, Dacor, Danby, E-wave, Electrolux, Estate, Frigidaire, GE, Gaggenau, Gibson, Goldstar, Haier, Hardwick, Hotpoint, Inglis, JC Penney, Jenn Air, Kelvinator, Kenmore, KitchenAid, LG, Magic Chef, Maytag, Modern Maid, Montgomery Ward, Norge, RCA, Roper, Samsung, Scotsman, Sharp, Sub Zero, Tappan, Thermador, U-Line, Universal, Westinghouse, and Whirlpool.